Correction. I am an over-thinker. According to family lore, this is a genetic disposition. 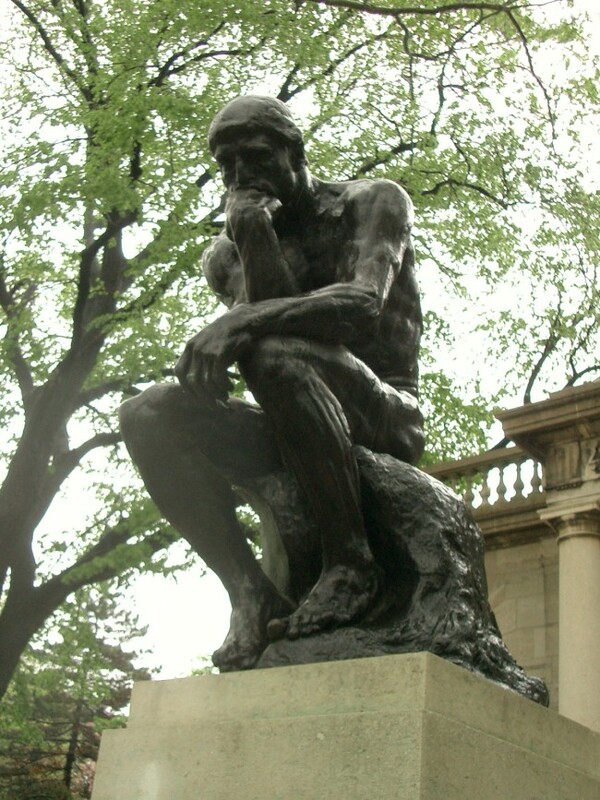 My great-grandfather was known to sit on the steps of the Enoch Pratt Library in Baltimore City, unintentionally posed like Rodin’s “The Thinker” and think, for hours on end. What happens, sometimes, when you’re an over-thinker is that you lose the moment you are in because you’re too busy trying to understand the past or consider what might happen in the future. This can slow a person down. Sometimes in a good way. Just today, I was stuck on a phone call for an hour and a half with an insurance company, where the person on the other end of the line was constantly asking me to wait while he retrieved this or that piece of information. I know many people who would have hung up on the guy after the tenth time he thanked them for their patience. But me, I let my mind go elsewhere while I waited. While he gathered the information he needed, I thought about a conversation I had yesterday regarding getting my writing published. By the time the call was over, I had jotted down the outline of a plan to make that happen in the near future. Sometimes the over-thinking, though, slows me down in a not-so-good way. I know I need to deal with the chair in our den that needs to be reupholstered, but I’ve been putting it off for weeks (no, months) because every time I’m about to make the call to the upholsterer (whose number is sitting front and center on my desk) I consider the down sides to dealing with somebody new who I may end up disliking or who may over-charge me or do a mediocre job. Instead of taking at face value my trusted friend’s recommendation of an upholsterer who is talented, helpful, reasonably priced and pleasant, I consider all the angles over and over again and always end up pushing off the call until next week. This is all fine and good until I go into the den and see how desperately that chair needs to be fixed. But I’m already onto some other project, so I remind myself to call tomorrow or next week, which thus far has meant never. I’m not convinced that it is all bad, the putting off making that call. It’s August after all and people are on vacation. And who wants to work on house stuff when the weather is nice and you could be outside enjoying it. And sometimes, when I dawdle in this way, a better solution comes along to whatever problem I’ve been pondering. Not that I can imagine what would be better than making the call in terms of getting the chair recovered sometime in the near future. I bet if I sit and think on it, my imagination may come up with that better thing that I haven’t yet considered.